January always comes with a strange mix of recipes in the blogosphere. Half Whole-30-inspired meals for people wanting a healthy kick off to the New Year. Half updated versions of your favorite comfort foods to warm people up from the inside out. After revisiting my original Mac n' Cheese recipe on National Spaghetti Day, though, I wondered: why not have the best of both (delicious) worlds? And that, my friendly foodies, is when this Secretly Superfood-Packed Slow Cooker Mac N' Cheese (a mouthful, but an accurately scrumptious one, I promise) was born! 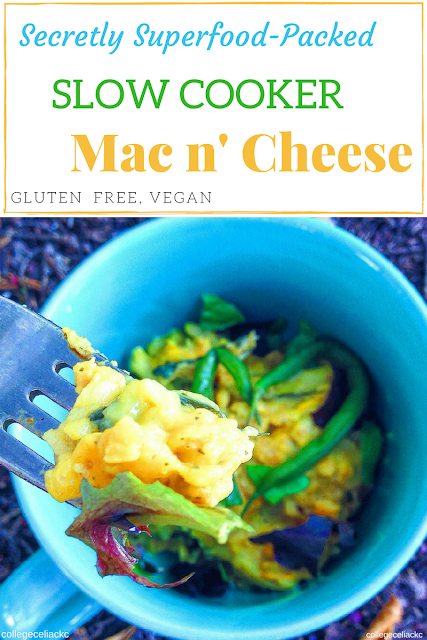 While offering the same soft, creamy texture of your favorite childhood dinner, this gluten free and vegan Mac n' cheese gives plenty of nutrients. It's free of most allergens, including gluten, nuts, soy, dairy and eggs. Even better, turmeric gives it a gorgeous yellow color and a boost of antioxidants and anti-inflammatories. Thanks to its long cooking time, your family will also hardly notice the spiralized veggies hiding inside. It also doesn't hurt that this recipe basically cooks itself in your crock pot. Read to dive into your own bowl of creamy, cozy and healthy comfort food? Then gather the ingredients below! Thanks to your trusty slow cooker and blender, this recipe is super easy to whip up. First, make your cheese sauce (or use your own favorite recipe) by blending all of the cooked ingredients in a high-speed blender. If it seems too thick, add a tablespoon more of water until it reaches your desired consistency. For an extra quick supper, make this cheese sauce ahead of time. It stays good in the fridge for around four days. I've even found that this sauce works just as deliciously after being frozen. To get it back to its creamy state, just warm it up in the oven, on the stove top or in the crock pot. With this recipe, you can just toss in cubes of the frozen cheese and it'll melt as everything else cooks! Once you're satisfyingly saucy, start putting the noodles, veggies, Daiya cheese and liquid (using only 3/4 cup of the water) into the crockpot. Then, scoop in some of your vegan cheese sauce. I don't measure how much; just eyeball it and add more or less depending on how cheesy you want it. I'd start with less and add more during the cooking process as needed. While the mac n' cheese may look a bit dry in the beginning, it turns into a (vegan) cheesy monster by the end! Then, simply turn your crock pot on low (to cook for 6-8 hours) or high (3-4 hours). I like to cook mainly on low, but crank my crock pot to high for 30 minute intervals every once in a while. This gives the mac n' cheese some crunchy, browned edges while keeping the middle soft and gooey. After two hours, you should add the last 1/4 cup of water and mix thoroughly. The cooking time varies depending on the size of your crock pot and how high you put the heat, so just start checking around 4 hours and stir every 1 or 2 hours. You know it's done when the cheese has melted, the veggies are soft to the point of disappearing into the sauce, and you can't find any undercooked noodles. Eating it is equally simple. For a well-rounded meal, add a source of protein (if your pasta noodles don't already have it) like chickpeas, white beans, ground turkey meat, ham - or, my roomies' favorite, bacon. I also like topping my bowl with some mixed greens and cabbage for a crunchy element. And, if your stomach needs a healthy boost, you can even pour on a little apple cider vinegar as "dressing." Addicted to that creamy goodness! While I happily devoured leftovers for dinner five days in a row, you can also freeze containers of this mac n' cheese for later. While it may come out a little drier (depending on if you let it defrost naturally or use your microwave), you can bring it back to life with a little cheese sauce, melted Daiya shreds or even avocado. January, to put it lightly, is a confusing time. Many people are craving a fresh start and trying to adopt new, healthy habits, but others are just trying to survive a cold winter and the start of another busy year. So why not feed your soul and your body by diving into a recipe that's cozy, packed superfoods like turmeric and hidden veggies, and takes 30 minutes or less to prep and throw in the crock pot? Maybe I'm being cheesy, but that sounds like a match made in heaven to me! What do you crave in January - lots of healthy food, comfort food or a mix? What's your favorite unique add-in to mac n' cheese? Tell me your thoughts below! This looks so amazing! Yum!! YUM! Hope you enjoy it! Holy moly look at that load of veggies!! I've seen this vegan cheese sauce using potatos/veggies so much recently I really really want to see what its all about. I love that I just learned its freezable, too (single living, ya know?). What kind of squash did you use? ?